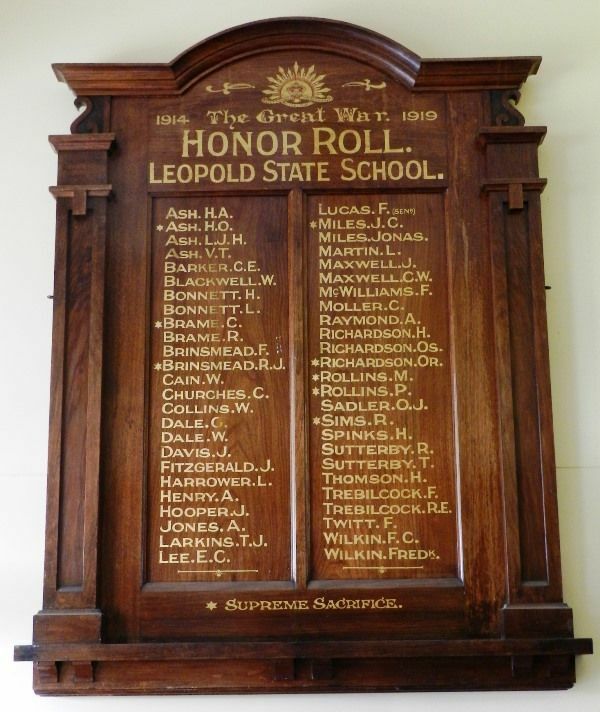 Leopold has an honour roll which contains the names of over 50 of its manhood who went to war, and they are justly proud of the fact. Yesterday afternoon the board was publicly unveiled by Mr. E. Morley, M.L.A., in the State School which was packed by parents and friends. Rev. Thomas Quinton presided. All the school children were lined up to form a guard of honor for the visitors, and they saluted the flag from the outset. The chairman made a short address, and introduced Mr. Morley, who explained to the children what the honor board meant, and gave them some interesting stories about the war. He impressed upon them the necessity for always respecting the Union Jack, which means so much to them in the past and would do so in the future. The children sang "Lest We Forget" gave three cheers for the King and the gathering dispersed. Geelong Advertiser (Vic), 11 May 1922.